Supports only original Camera and Sjcam Camera. Allows you power the Dual USB Charger with included Mini USB cord, also you can use your own micro usb cable. Can be powered with most standard USB Wall or Auto Charger or a computer. 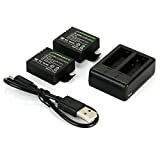 Charges two SJ4000 camera batteries at the same time. Smart LED light indicates RED when charging and GREEN when complete. Includes 2pcs 1100mAh batteries, 1 Dual USB charger, 1 Mini USB cord. This entry was posted in Discount Photography and tagged 1100mAh, 3.7V, Battery, BC495, Camera, Charger, Cradle, Dual, LiIon, Pack, Rechargeable, Sj4000, Sj5000, Sports, XCSOURCE® by Ball Photo. Bookmark the permalink.